Why has the annual number of Earthquakes, above 6 Richter, increased close to double starting 1994? Where is the thermal energy, that forms the Temperature Belts of homogenous climates, coming from? Why is North America getting warmer winters while Siberia is getting colder ones? What is the relation between the weakening of Earth’s magnetic field and Global Warming? Could the reasons behind Earth Ice Cap melting be the same behind Mars Ice Cap receding? and why is Ice growing in east Antarctica while eroding in its west? Why are there patches of Reversed Magnetic Fields in Antarctica? and why they start emerging only 10,000 years ago? What makes Earth spin about its axis, speed up at times and slow down at times by milliseconds every day? Will Earth slow down its spin, similar to Venus and Saturn in recent years, each has slowed down by 6 to 8 minutes over a period of 27 years? Is there a time cycle of Climate Change? Did history text, in holy books, speak about several and sudden Climate Changes? What wrong did historians do when they decoded the Mayan Calendar? Why December 2012 date, for an end of cycle and a beginning of a new one, is an incorrect decryption and what could be the correct date? There is a Global Warming which, according to the research you will read on these pages, is attributed to the weakening of the magnetic field by an average of 15% in the western and southern hemispheres between the years 1850 and 2012. One third of the field drop took place in the last decade and one third of the drop took place between 1970 and 2000. There is also Climate Exchange; whereas the ice cap is melting in the Arctic Circle, the ice sheet is growing in Antarctica’s eastern region. According to this research, the Temperature Belts are very much influenced by the location of the magnetic pole as well as the strength of the magnetic field. Belts or regions of homogenous climates are centred on the magnetic poles. 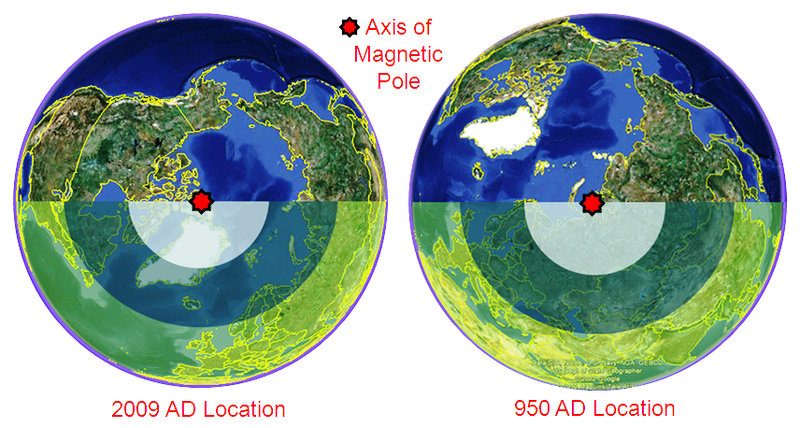 The south polarity magnetic pole in the Arctic circle is moving from Canada towards Siberia. The Temperature Belts are accordingly tilting along. This explains why North America is getting shorter and warmer winters while Siberia is getting longer and colder ones over the past few years. Albeit, a whole year average temperature in Siberia might be set off by the overall increase in global temperature. Global Warming and Climate Exchange are not anthropogenic. There is a cycle of change. Ancient texts and geology records speak of it, as you will read over the coming few pages. The challenge would be to design and affect the right strategies to transform basic industries such as Agriculture, Energy, Infrastructure, and so on to a new paradigm, of life on Earth that is approaching in the not distant future. This site answers all above and explains to the reader, the Earth Changes that are taking place; the cause, the reasons and the consequences. After having gone through the pages of this site, I recommend you watch this summary video that was delivered at TEDx Abu Dhabi on May 26, 2012. Thank you Bill. I have spanned my research, as published on Dec 2009 on http://www.amazon.com/More-Than-60-Minutes-Stands/dp/1439257914/ref=sr_1_1/184-5876538-3345152?s=books&ie=UTF8&qid=1451730736&sr=1-1&keywords=More+Than+60+Minutes-+when+earth+stands+still to introduce a probable magnetic configuration of our planet that is never introduced before (induced + permanent), the influence of the thermal radiation of the Thermosphere region on the formation of the Temperature Belts, a completely new proposition on the elements influencing the spin speed and related variation at sea levels across the planet. I had to research ancient text and geological findings (such as the first formation of plasmoids in the Antarctic) to deduce a cycle of Earth changes that span climate to geography and time changes. My analysis leads to a climax on August 2017 when accelerated magnetic poles movement, Temperature Belts tilt, slower spin speed and rising sea levels northern to N39 and southern to S39 will occur. In return, the sea levels between N39 and S39 would spotlessly recess. A good summary of the book that is referenced above is made available on the pages of this site. Continuous feeds of geological, scientific and/ or historical discoveries are published as they come as posts and add a great value to ascertain the model I introduced earlier. The difference in this research than several others, is the “integration of existing theories of physics, electromagnetism, geology, human biology, ancient text and astronomy with a new insight to explain Earth Changes, Change Cycle and the probable date of the Change Climax”. Accordingly, the full site has to be read as a whole and not in a fragmented way for better evaluation. Everyone is taught from textbooks that our Earth is so constructed. In this article, very much is described about the depth to what extent it can be drilled in our earth. Russia such as America have made various attempts to drill much deeper, this what has been achieved until today. I read carefully the site you referred to on wikipedia. I can not comment on it since it is based on new ‘geological’ discovery that is not referenced elsewhere. What I can comment upon is that the model I developed for the magnetism of Earth, which I based on established geological findings and proven geophysics that are challenged by you referenced site, helped me to explain the emergence of Plasmoids, or reversed magnetic field in Antarctica, South Atlantic Anomaly, Climate Exchange and Global Warming. You may find it on https://planet-earth-2017.com/the-true-source-of-earth-magnetic-field/ . I deployed the same model and found it to also work and explain the magnetic configuration on Mars https://planet-earth-2017.com/mars-warming/ and Uranus https://planet-earth-2017.com/2017/07/ . And, for all 3 planets such a magnetic modelling helped me to explained why these planets spin about their axes and what controls the spin direction and speed. Thank you very much for your reaction, which I appreciate very much. You can absolutely use any information, such as if necessary, to take it with you in your presentation and or publish it on your website. There is no copyright on the findings and research. Your clear presence, more people should know about the truth of our Earth and solar system in general. You write and verbally state, “climate exchange” that which is absolutely the perfect word, then climate change. What has changed is our air quality, and that is totally different from climate change in my opinion. I have seen my “doubts” about air quality that in the first industrial revolution and the second industrial revolution, we burned coal to make the machines work. The population needs proofs such as videos, explaining an example of what is meant. A picture, people do not say much when talking about, there is currently a 10 ° gap between Earth’s axis of rotation and the magnetic pole in the Arctic Circle to the center of Earth. This gap angle is changing as manifested by the wandering poles. That which changed our Earth Temperature to another and also the melting of the South Pole. However, exactly how it describes, Magnetic Poles and Ice Caps move in Tandem. Currently we are working on a team, to show everything in a video, that which you explain on your website. The reason why we explain this with videos with examples has to do with the following. Every person has a learning level in various areas that they are good at. People who are not familiar with this knowledge level, will have to explain it differently as with videos. Then with your text and with any videos there, people will actually wake up what is actually meant by “climate exchange” here on our Earth. I want to share this video with you, as soon as you are interested in this on your website. Finally, every video is recorded without any recorded text. So that each one can speak his spoken text in their own spoken language and add sub-titles. There is a couple of flaws in the 2012 TEDx video. I kept it as is and did not change. However, the empirical model that I developed for the Thermosphere temperature gave conclusive evidence about the impact of a changed magnetic field location and strengths on the climates and temperatures on the surface of the planet. I am not sure which part of the video you shall use, but if need be, I could make some fresh slides on certain topic with my voice on top to be part of your syndicated video! Saw your great TED talk and that led me here. Stunning conclusions. Turns climate change politics on its head. Would like to see more thoughts on the correlation between recent astronomical body research (such as Mike Brown and K. Batygin on Planet 9, and other bodies) that may affect the shape/strength of the magnetic field around Earth. Are there historical asteroids, comets or planets that can be tied directly to known polar shifts? And can the wandering of the magnetic poles account for most temperature belt phenomenon, such as the Saharan desert vs. tropic cycle, that has been tracked geologically? Since 2012 I improved the analytical model of the Thermosphere temperature map, added new discoveries that confirm the assumptions, which I made earlier about the permanent magnetic features of the solid inner core.. you may find more on the pages of this site and monthly posts. For instance the same model was applied on Saturn to explain why it spins in an opposite direction to Earth’s spin. Ancient text and geological discoveries when connected to Earth temperature and spin models that as I manifested earlier lead to one culprit and a cycle of change. I believe if we decipher the Maya tablets with an open mind that number of days per year vary, then we could come closer to most likely date at which current cycle ends and a new one begins.